This categorisation cannot represent all possible types of game productions. Participants were asked to resemble the last project they worked on to the category that fits the most. For the purpose of homogenous data, participants were asked to only count composers, sound designers, audio directors and audio programmers to the audio team and not external people like live musicians, voice artists etc. For casual, indie and smaller budget games, the core audio team mainly consists of 1 to 3 people. Teams in big budget productions can differ in size tremendously. Teams of 4 to 12 people are not unusual. In 50% of the big budget productions, the participants worked more than 12 months on the project. Audio production for casual and indie games usually took less than 3 months. For insights on communication standards with clients, please request your free PDF copy of the full report now by contacting me directly via yannick[at]gameaudioindustry.com. For insights on how video game music is used outside the game, please request your free PDF copy of the full report now by contacting me directly via yannick[at]gameaudioindustry.com. 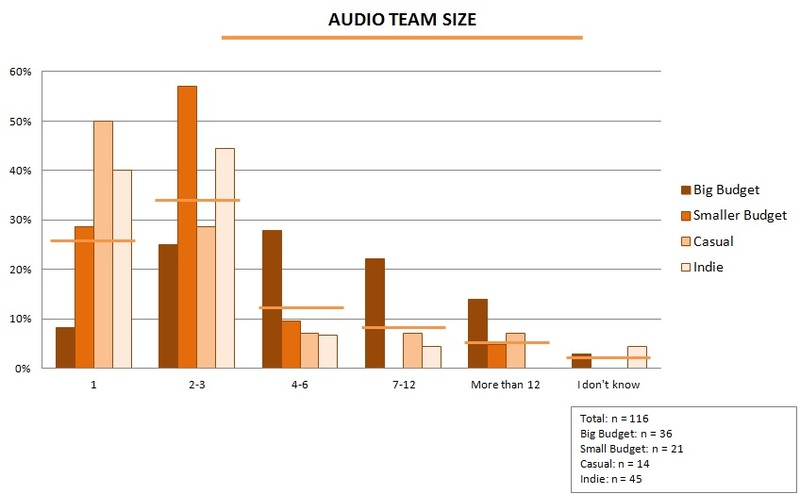 For insights on the business practice of speculative demos, please request your free PDF copy of the full report now by contacting me directly via yannick[at]gameaudioindustry.com. FMOD (20%) and Wwise (17%) are the most used audio middleware solutions in game productions. In 20% of the game productions, a custom solution of the developer was used. 25% of the games didn’t use any middleware. 14% of the participants said they don’t know if or which middleware solution was used in their last project. For the last project they worked on, 62% of the pure freelancers worked with a studio based in the same country they live in. 25% of the participants worked with a developer based in another country. 12% could not give a clear answer, for example when the developers were located in different countries without a joint office. Possible reasons for the preference of working with a studio from their home country might be better local networks, no language barriers, or simply personal preference. These reasons should be subject of future research. For most casual and indie games the music was done by the composer alone, either with samples only or with self-played and self-recorded instruments. 70% of the big budget productions had at least some of their music recorded live by hired musicians. In 91,4% of the productions, there was no separate budget for live recordings (54,8%) or the participants did not know if there was a separate budget for live recordings (36,6%). If there were any separate budgets available, they varied tremendously between 300€ and 80,000€. The mean budget was 13,190€ (median: 3,269€). The most named places for live orchestra recordings were Budapest (Hungary) (5x), London (United Kingdom) (3x) and Sofia (Bulgaria) (2x). Because of the low number of responses, this has only very limited informative value.